National Fuel supplies natural gas to over 730,000 residential and corporate customers throughout Western New York and northwestern Pennsylvania. The Williamsville, NY-based oil and gas concern is vertically integrated across five business divisions: Exploration & Production, Pipeline & Storage, Gathering, Utility, and Energy Marketing, all operating largely within the Buffalo metropolitan area. National Fuel filed a request late last week with the New York State Public Service Commission to increase utility base rates for New York customers. If approved, it will result in a 7.2% increase in delivery rates, an additional $5.75 a month on a typical gas bill, from approximately $80 to $85.75. The price hike is projected to enhance National Fuel’s annual revenue by $41.7 million a year, a 7.9% boost to its bottom line. At precisely the same time National Fuel was petitioning for a rate increase in New York, it was acting to lower rates in Pennsylvania. On Friday, National Fuel submitted an application to the Pennsylvania Public Utility Commission seeking to lower consumer and business gas supply charges by 6.46%. Taking immediate effect on Monday, May 1, the average Pennsylvania gas bill was reduced by $3.46, from $53.55 to $50.09. To summarize, National Fuel’s business policies appear to reflect “a tale of two states”. A natural gas price increase is levied on Western New York, the stated purpose of which is to underwrite modernization of pipelines, while rates are lowered in Pennsylvania, where pipeline modernization is continuing unabated, as laid out in two press releases issued within 24 hours of each other. As a top fracker, National Fuel has lately been victimized by its own success. Gas drillers have extracted so much of the fossil fuel from the Marcellus Shale formation in Pennsylvania that a massive supply glut has resulted, depressing prices and negatively impacting the company’s net income. In fact, National Fuel reported a consolidated net loss of $147.7 million, or $1.74 per share, for the 2nd quarter of 2016 alone, its Exploration and Production (fracking) segment hemorrhaging capital. 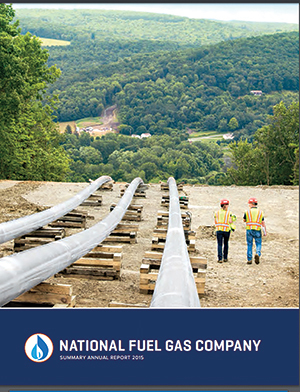 The cover of National Fuel Gas’ 2015 annual report shows a pipeline running directly into a scenic rural town and two helmeted workers walking along it for perspective. In spite of this recent poor performance, shareholder dividends have risen every year for the past five decades, including a 2015 $1.58 per share dividend and a quarterly dividend of $0.395 paid last month. Clearly, National Fuel has chosen to finance the “continued system modernization of National Fuel’s pipeline infrastructure” at the expense of New York (not Pennsylvania) ratepayers, rather than inflict dividend cuts on its investors. It’s no secret that National Fuel intends to pick up its long-term financial slack by exporting fracked gas to Canada, and to accomplish that goal, is implementing an aggressive build-out of pipeline through Niagara County communities, to appreciable pushback from local citizen groups including the Pendleton and Wheatfield “Action Teams”, together comprising nearly a thousand members on Facebook. 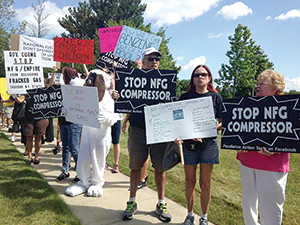 National Fuel is on the verge of constructing a noisy 22,000 horsepower compressor station in the town of Pendleton and a carcinogen-emitting dehydration station in Wheatfield to support its Canadian pipeline link. Of course, this is the “pipeline infrastructure modernization”, cited repeatedly in National Fuel annual reports, press releases and on its web site, that it intends to complete on the backs of New York, but not Pennsylvania, ratepayers.